That’s an understandable question. Even though rowing machines aren’t completely popular with the average gym member, they have increased in popularity in the last few years and for a good reason. This machine doesn’t just deliver a great cardio workout, but it is also great at working both the upper and lower body and even gives your core a good burn. 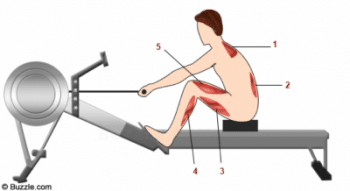 There are four significant positions when using the rowing machine. Two of the four areas; the “drive” and the “finish” work almost every muscle in the upper body. These muscles include the rhomboids, trapezius, and deltoids of the shoulders and upper back. It also consists of the triceps, biceps, and forearms. And last but not least, rowing works the pectorals, or chest muscles. As you can see, there wasn’t one upper body muscle not mentioned. Are you looking to increase your strength and muscle tone in your upper body? Using the rowing machine is a great choice. Rowing will also use lower body muscles. 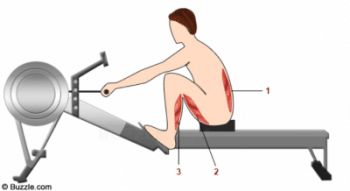 Every position of rowing will work some of the lower body muscles. In the catch position, as shown below, the lower back, hamstrings and calf muscles are worked. In the start of the drive, you continue to work the hamstrings and calf muscles but also engage the quadriceps. In the other two positions as seen in the section of the upper body muscles. You can see that the glutes also come into play and the quads, hamstrings, and calves are still being used. The core muscles are essential in keeping the entire body strong and healthy. These muscles include the muscles in the back and stomach. 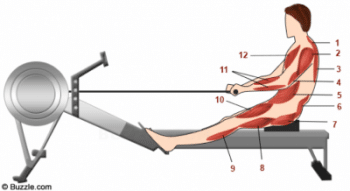 Yes, you guessed it, the rowing machine also works these muscles. Notice in all four images, the lower back muscles, or the erector spinae, is engaged. In the first two images, the abdominals and obliques (the sides of the torso), are also being worked. That pretty much covers all the major muscles in the core. 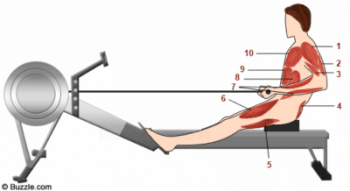 So, to sum this up, what muscles do a rowing machine work? All of them! What other machine do you know that can deliver those promises? But that’s not all. Keep reading to find out what other fitness benefits rowing machines give. So, technically, the heart is a muscle. Using the rowing machine at a good speed will give you a reasonable cardio workout. This will strengthen your heart and your lungs and increase your metabolism. You’ll be burning calories all day long! Because rowing uses a mixture of both upper and lower body muscles, it increases your heart rate. Your heart needs to keep pumping blood from the arms to the legs and back and forth. Another useful aspect of the rowing machine is your ability to adjust the resistance of the row. You can make it harder to pull or easier. Lowering the resistance will allow you to row faster and get more of a cardio workout. Increasing the resistance will make it more of a strength workout, but believe me, your heart will still be pumping at high rates. There are so many reasons to use a rowing machine. It’s useful to men and women and can be used by people of any fitness level. Check out this video for more great benefits of using a rowing machine. Start Using A Rowing Machine Right Away! Has this article helped you to see the value of using a rowing machine? If a fitness machine that works every major muscle in the body and also delivers a great cardio workout isn’t the best fitness machine out there, I don’t know what is. What do you think? Will you be looking at including the rowing machine into your fitness regime? Maybe you’re still torn? If you have any questions, feel free to ask them in the comments below.